By migrating workloads to public or private clouds, you can enhance agility, reduce costs, and free IT resources to focus on core initiatives, instead of manually managing complex infrastructure. However, conventional IT management approaches require manual processes and siloed solutions that can undercut the very benefits you seek from cloud deployments. Legacy solutions lack the visibility and agility you need to effectively manage cloud workloads, especially when those workloads are distributed across a hybrid of private and public cloud infrastructure. They also create inefficiencies and inconsistencies that hinder deployments, cause network disruptions, and increase your security risks. With Next Level Networking from Infoblox, you can efficiently control and secure workloads in hybrid cloud environments. Our solution gives you the unique ability to automate and consolidate critical aspects of hybrid cloud network management, respond rapidly to business needs, and integrate with the industry’s broadest array of cloud-based platforms. We are the industry-leading platform for DNS, DHCP, and IPAM and ours is the only platform that offers built-in adaptors, automated discovery, and out-of-the-box integration for leading virtualization and public cloud management platforms including AWS, VMware, Docker, OpenStack, and Microsoft Azure. Empowers DNS and IP address provisioning with pre-built integration with platforms including VMware, OpenStack and Microsoft. The API integration allows new VMs to be created. 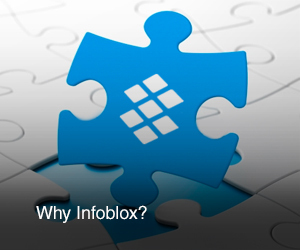 In addition, the workflow automatically communicates with Infoblox DDI for the correct DNS record and IP address without the need for opening tickets or performing manual provisioning across multiple teams.